The venture capital industry had a blockbuster year in 2018. With close to $130 billion invested in the US, it broke the $100 billion threshold set at the height of the Dot-Com Bubble in 2000. As we look forward to the year ahead, it’s helpful to step back and evaluate the role of the VC industry and understand the impact it continues to have on innovation. The VC industry was initially built as a way to commercialize disruptive technologies that were being developed by leading researchers. At the time (60s-70s), most of the technologies were developed on the West Coast, while money resided on the East Coast. Traditional VCs had the vision to build a bridge between lab and market and bring East Coast capital to invest in West Coast research. Traditional venture was built on partnerships between researchers, venture capitalists/investors and management teams. Companies like Genentech, Cysco, Intel, Apple, HP and SUN Microsystems all followed a very similar path. Back then, VCs went directly to the source of innovation. They sourced deals in places where few were looking and in most cases, they took in founder’s equity, or became a significant shareholder, and were heavily involved in managing and building the business. In the early days of venture Capital, VCs were disruptors. They identified, vetted and launched technologies directly from labs, and helped companies navigate the Valley of Death by building bridges between capital and ideas and lab and market. Over the years, the role of traditional venture has shifted dramatically. As more and more capital was chasing the success of the early pioneers, funds became larger and the role of traditional venture shifted from the original disruptors to followers. To better understand the role of venture, we need to understand where the money is going. 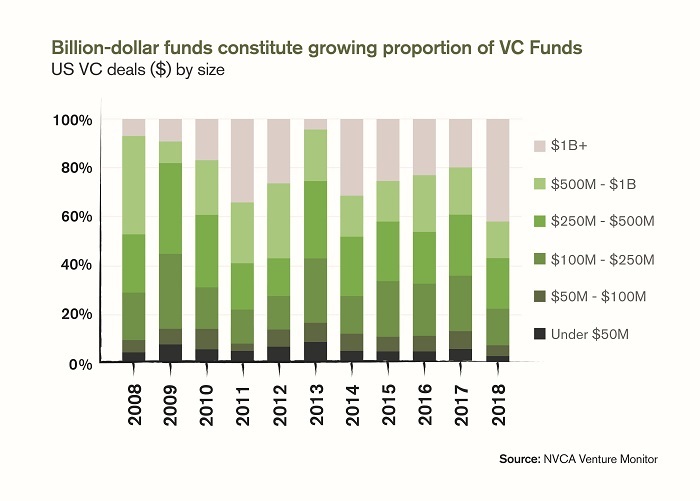 As of 2018, 61 percent of VC investments were $50M+ in size and 76 percent were over $25M. Just a decade ago, $50M+ deals would represent approximately 20 percent and $25M+ around 40 percent. There has been a dramatic shift to later stage deals, which has doubled in size over the last decade. Meanwhile, the percentage of deals under $5, $10 and $25 million have been cut in most cases by half. 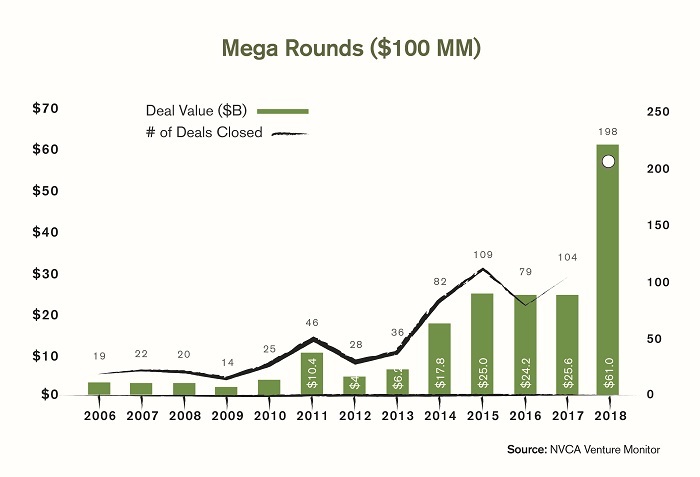 In 2018, mega-rounds ($100MM +) had a spectacular year. Most of these investments are going into established private companies — the so-called unicorns. 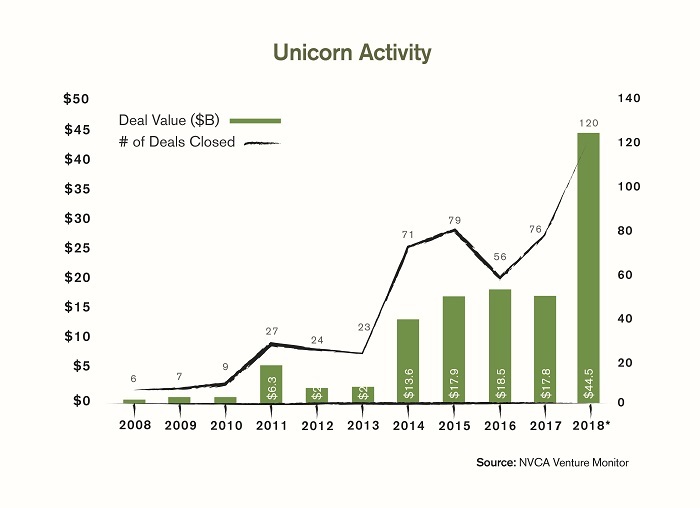 A decade ago, unicorns comprised around one percent of the number of deals and dollar values invested in venture. Fast forward to 2018, and unicorns still account for roughly 1.3 percent of deals, but have skyrocketed to around 34 percent of dollars invested in venture. Mega-rounds comprised a minuscule share of deal count, 2.20 percent, but raised a staggering 47 percent of all money in venture in 2018. 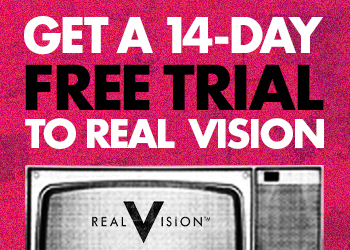 True innovation is not happening at the long tail — it happens at the concept stage. Over $70B is invested annually in basic R&D via universities, which consists of federal grants and taxpayer money dedicated to funding innovation. However, less than one percent is invested by the research institutions to bring these innovations to market. 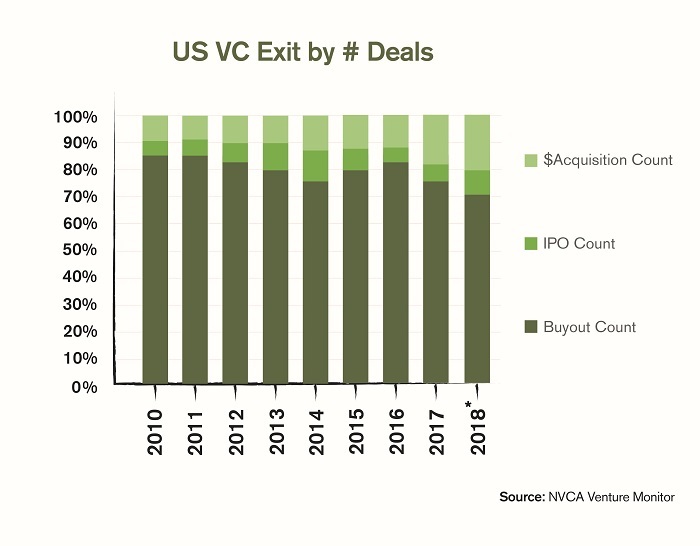 At the same time, VCs have significantly reduced their commitment to early-stage venture, which was the cornerstone and origin of the venture industry. 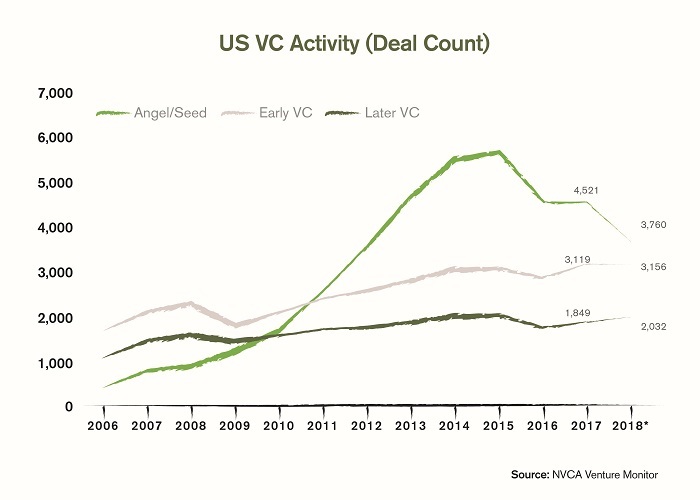 Angel and seed rounds have collapsed by 34 percent since 2015. 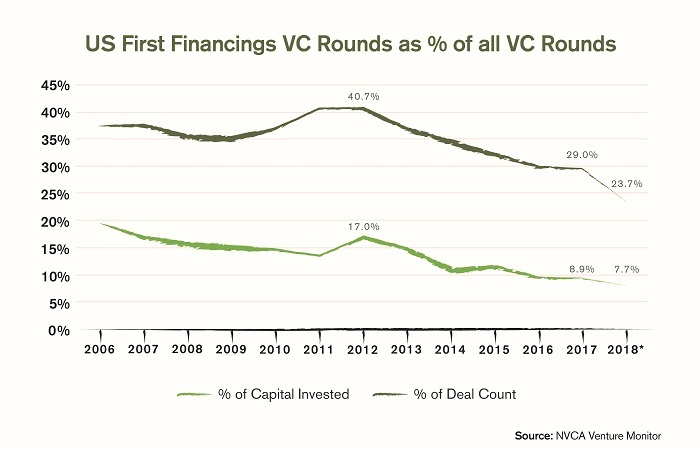 First financings have continued its downward trend and now represent only 7.7 percent of capital invested, which is down from 20 percent a decade ago. Therefore, over 95 percent of university-led research never reaches the market, and life-changing research sits idle in national labs. Mega-rounds and unicorns should no longer be considered venture capital. They are polluting the statistics and making it seem like traditional venture is alive and well, while in reality, early-stage venture is suffering. Pursue technologies that have been developed and reinforced by significant investments in R&D at leading research institutions. If technologies that survive the venture development vetting process, top, talented CEOs need to be recruited as well as operators to be part of the company’s founding cap table. 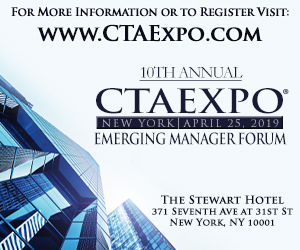 Be heavily involved in the launch and operations of the business alongside each company’s management team. Focus on deep tech businesses that solve real world problems. We are not investing or developing the latest trending app; we prefer to focus on disrupting industries all that are backed by strong and significant IP. Having access to founding equity in the companies launched makes all the difference, as valuation is the key-determining factor of potential return. Just like the original VCs went looking for opportunities outside of Wall Street and landed in West Coast to help create Silicon Valley, look for opportunities outside the mainstream. For example, in the Midwest, you have access to world-class technologies, infrastructure and teams at a fraction of the cost of the coasts. And while your companies may be located in the Heartland, you can continue to make great strides in developing relationships worldwide. The CEOs can relocate the companies where they see a strategic fit. So, they have the lower cost benefits of being in the Midwest and valuation arbitrage as the operating business settle in places like San Francisco, NYC or Shanghai. Since investors are leveraging the billions already invested in innovation from universities, the infrastructure of leading research labs and the cost-efficiencies of operating in the Midwest, shareholders experience less dilution. This means you buy low and sell high, not the other way around. Build the companies to become fast growing, profitable businesses that can go all the way to IPOs; but given current exit dynamics, position portfolio companies in such a way that they can be acquisition targets. Develop the companies with a clear “build to sell” focus. 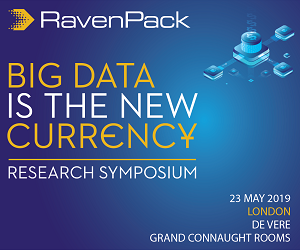 Today, the biggest opportunities are already in development at major research institutions. Billions are being invested to fund innovation. Traditional venture needs to break the shackles of “spray and pray” strategies and remove the lemming mentality that currently permeates the unicorn driven market. VCs need to look to the early trailblazers that created the industry and refocus their efforts on funding true breakthroughs and change the cycle created by chasing unicorns.